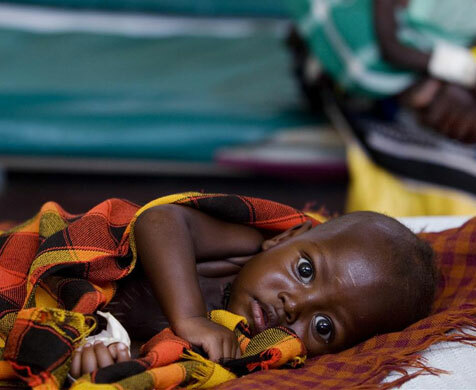 I've started writing a riveting Flora Focus post, but I decided to put it on hold because the story of the starving children in Somalia has gripped my heart and won't let go. I'll admit that I don't pay enough attention to the needs of the worst off in our world, and I don't give as much as I could, but the contrast between my life, where a dire drought means that I only have enough water to keep my plants 75% lush, and theirs, where the worst drought in 60 years means that crops are non-existent, food animals are dead, and children are dying -- DYING -- is impossible to ignore. So last night I got out my credit card (well, Steve's, 'cause his company matches charitable contributions) and made a donation to UNICEF. If I were Angelina, I'd be making plans to go over and rescue some babies. In fact, a part of me wants to even though I'm not Angelina. And since it's probably too much to ask you to go to Africa and rescue babies, I implore you to give whatever you can to help these poor, starving children. Of course, you can't go wrong giving to the Red Cross, either. You can select the Horn of Africa Drought for your donation. And I'm not above tugging at your heart strings by posting a picture of one of the beautiful children who have been affected by this crisis. The photo that's been on CNN clearly shows the magnitude of the situation, but I can't bear to post it. Copyright concerns aside, it's just too sad. So I will show this picture of a baby who, unfortunately, might be just as sick, but he still has enough plumpness to grab my heart instead of absolutely breaking it. To end this post on a lighter (but not entirely unrelated) note, have you checked out First-World Problems on Twitter? Unfortunately, the writer chose today to get serious with an item about election reform, but there's some riotiously funny stuff (which also serves as a reminder of how lucky we are). Favorites include "I can't hear what my friend is saying because we're driving his boat too fast," "I'm going to be late for work because someone on the internet is wrong and I need to tell them that," and "My Netflix bill is going up by $5 and I'm furious." My own first-world problem of the day? My office got a new microwave, and it leaves my tea too hot for the first inch and too cold below that. So, against that backdrop of how lame our problems really are, I ask that you please, please help the sweet children of Somalia. Thanks for this post. Just donated. Thank you, Michele. You have no idea how happy that makes me.